This miracle food reverses memory loss? Home » Brain Function » Memory » This miracle food reverses memory loss? A mystery chocolate drink, made by confectionery company Mars, Incorporated, has turned back the clock on aging brains. Chocolate is even better for us than we thought! A breakthrough study by Columbia University Medical Center has uncovered something quite remarkable: Normal, natural memory loss that comes with aging can be reversed. Not with some dangerous pharmaceutical cocktail, either. This is by a drink made from natural cocoa beans. The beans are rich in cocoa flavanols, which are antioxidants that fight off cell damage. Forget the prunes and vegetable juicing, and make way for youth by chocolate! Could the news get any better than that? A typical 60 year old could reverse normal age-related memory loss by two or three decades consuming the special tonic, changing their memory power to that of a 30 or 40 year old. I’ve got an emergency stash of chocolate-covered almonds in the glove compartment in my car (funny, I have an emergency come up at least twice a week! ), and premium Ghirardelli dark chocolate chips in my fridge freezer. Frozen, there’s a whole different mouth-feel and lingering enjoyment, so I tend to eat less. Now I know full well that chocolate is not the be-all, end-all when it comes to your health, even though the cocoa flavanols have been shown to be beneficial for your heart, brain and mood. Some days, I feel I need all the help I can get. I’m also aware that you can get these flavanols in tea, red wine, grape juice and many other plant foods (cue your five-plus servings of fruits and vegetables here). But, hey, it’s like a party when I can have a bit of red wine and a dark chocolate truffle (or three) and feel good about it! I’m a working mom, after all. Put the brakes on your next chocolate fix, however. The Columbia researchers who conducted the cocoa and memory study say you can’t reap the same benefits by eating chocolate, no matter how dark or how high the cocoa content. That’s taking a machete to my party balloons, but you’ve got to take the bad news with the good. Lead researcher, Dr. Scott Small, professor of neurology in the school’s Taub Institute for Research on Alzheimer’s Disease and the Aging Brain, says it’s true that cocoa flavanols are found in chocolate, but only in very small amounts – and consuming a lot of chocolate is simply bad for your health. Can you get the same memory-reversal effect by eating expensive high-quality chocolate? “Categorically not,” he insists. What about hot chocolate, made from scratch so you can control the added sugar? No dice, either. Most of the flavanols from cocoa beans are removed during processing. For this three-month study on middle-aged participants, Mars supplied the project with a proprietary drink super-high in cocoa flavanols, but not available for purchase – as yet. But the family-run company, maker of Mars, Snickers and Twix bars, to name a few, will certainly benefit from the media flurry over the study’s association of chocolate and memory rehab. I’m betting a cocoa beverage, a first for reversing the normal effects of aging on memory, will be forthcoming to open arms. The 37 healthy volunteers in the Columbia study, ages 50 to 69, either drank a high-flavanol diet (900 mg of flavanols a day) or a low-flavanol diet (10 mg of flavanols a day) for three months. Participants underwent brain imaging scans and memory tests before and after the study. In those with the high-flavanol diet, the researchers found marked improvement in an area of the brain affected by normal aging. Let me clarify this just a bit: It’s normal as people age to show some decline in cognitive abilities, including learning and remembering things like where they parked their car or left their keys. Sound familiar? I once parked at a shopping mall, went inside to a few stores and came back out a different entrance. I spent half an hour marching up and down the rows with increasing panic until I realized I was at the opposite side of the mall. This normal age-related memory decline starts in early adulthood but usually does not have any noticeable impact on quality of life until people reach their 50s or 60s. Age-related memory decline is different from the memory impairment that happens with dementia and Alzheimer’s, where disease damages and destroys neurons in various parts of the brain, including the memory circuits. So we can’t know from this research whether a diet high in cocoa would have any effect in either preventing or delaying the onset of Alzheimer’s, for example. The other win, though, for Columbia researchers was the discovery of a definitive link between changes in a specific part of the brain called the “dentate gyrus” and age-related memory decline. Until now, the evidence in humans showed only a correlational link, not a causal one. Flavanols extracted from cocoa beans previously had been found to improve neuronal connections in the dentate gyrus of mice. Of mice and men, apparently! 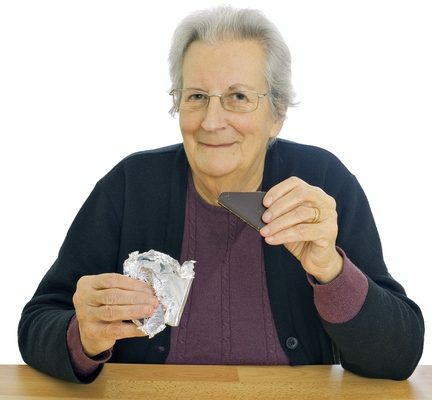 This small trial highlights some possible effects of flavanols found in cocoa beans over a short time period, but researchers plan to conduct much longer, large-scale studies to fully understand whether a diet high in these flavanols could boost cognition in older adults. Sign me up! Interesting, Mars was also behind a 2012 study by Italian researchers to look at a similar high-flavanol cocoa drink and brain health. The study, published in Hypertension, involved 90 people over 65 with mild cognitive impairment (MCI). MCI causes memory problems more serious than those brought on by normal aging, but less severe than those of dementia. A huge 20 percent of people over 70, estimates show, have MCI, and about 5 percent of those affected progress to dementia each year. The participants drank a cocoa beverage daily which contained high, intermediate or low levels of flavanols. After eight weeks, the high-flavanol group scored better on cognition, memory and verbal fluency tests, followed by the intermediate-flavanol group. In addition, their blood pressure and blood sugar control also showed improvement. The cognitive benefits were linked to better insulin sensitivity, which is a major factor in blood sugar control as well as brain function. Researchers also said the boost to cardiovascular health is telling – what is good for the heart is good for the brain. The big takeaway is that lifestyle and diet really can combat the downsides of aging. It’s a clear message: We don’t need to be so reliant on pharmaceuticals! We don’t need to put ourselves at risk for the dangerous side effects of medications. When it comes to reversing memory loss, high-dose cocoa flavanols offer a real solution, pending larger and long-term studies. I’m going to be on the lookout for a certain Mars beverage! Meantime, no more guilt over those handy chocolate-covered almonds.